1. Enjoy some of the overlooked attractions (I have written about some of these, and will write about more later.) We have found that we enjoy the non-headliner attractions as much or more as the headliner rides/attractions. The crowds tend to be less and you can actually do more this way. 2. If you are a night person, stay until the park closes. Crowds thin out near closing, and the WDW parks allow you to stay for one hour after official park closing, a fact we didn’t know until we had visited several times. 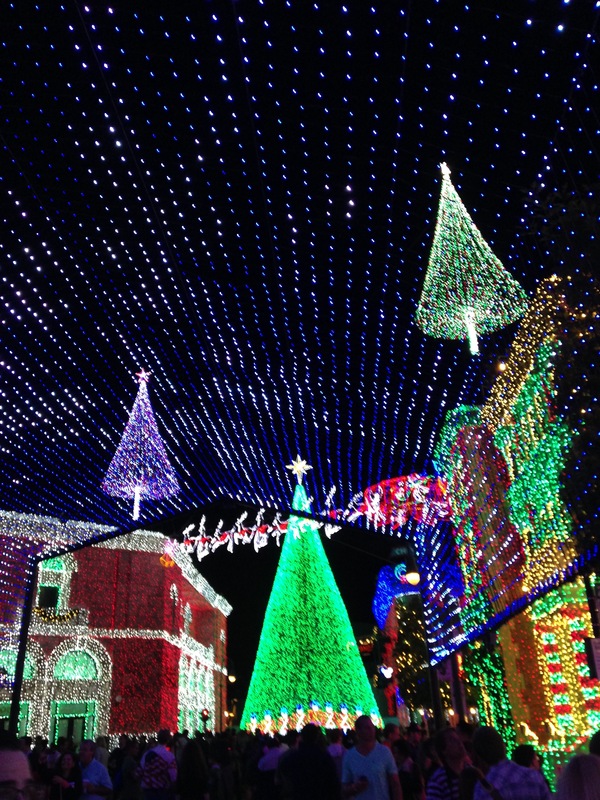 This can be a time to relax, browse the stores, and walk through Main Street in Magic Kingdom, or during Christmas, the Osbourne Family Spectacle of Dancing Lights in Hollywood Studios. 3. If an important part of your vacation is the Disney dining experience, then know it will take up a decent portion of your day. Unless you are really into the dining experience, I recommend that you not spend a lot of time at a table-service restaurant. You will save time (and money!) for other things like rides and shows. 4. If leaving your room near meal-time, eat at a quick-service dining location at your resort instead of at the parks. Usually the wait is shorter. You can eat and then be ready to hit the parks. 5. If you are flying to Orlando/Walt Disney World, and it is possible, book a flight with an early arrival and a late departure. This allows for some extra time at the parks. 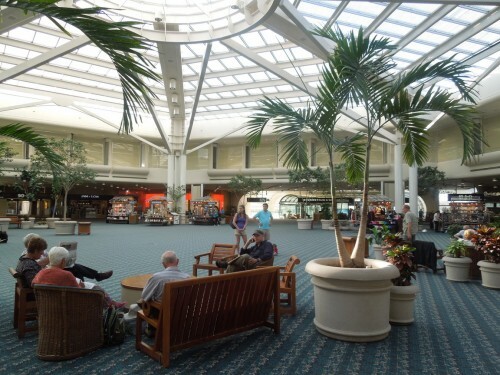 If you are using Magic Express from Orlando International Airport to get to your resort, know that it does take up to an 1 and 1/2 hours, depending on how long you have to wait on the bus and how many drop offs are prior to your resort. On the day you leave, if returning to the airport with Magic Express, you must catch the bus 3 hours before your flight is scheduled to leave. 6. This may be obvious, but it bears stating – Don’t stand in line for over 15-20 minutes for an attraction/ride. Use FastPass+ and Extra Magic Hours to enjoy the major attractions with minimal wait and enjoy rides with shorter wait times for the rest of the day (Please refer to prior post Rides with Short Wait Times) . I hope that you find these useful. Remember, the magic of Disney is in the details. Saving time by avoiding lines and waits will allow you more time to notice the details, relax, and enjoy your vacation. Elaine (Perdita): Mom, wife, Disney fanatic. This usually means less bus transportation. Choose the quickest transportation options if you have a choice of more than one. 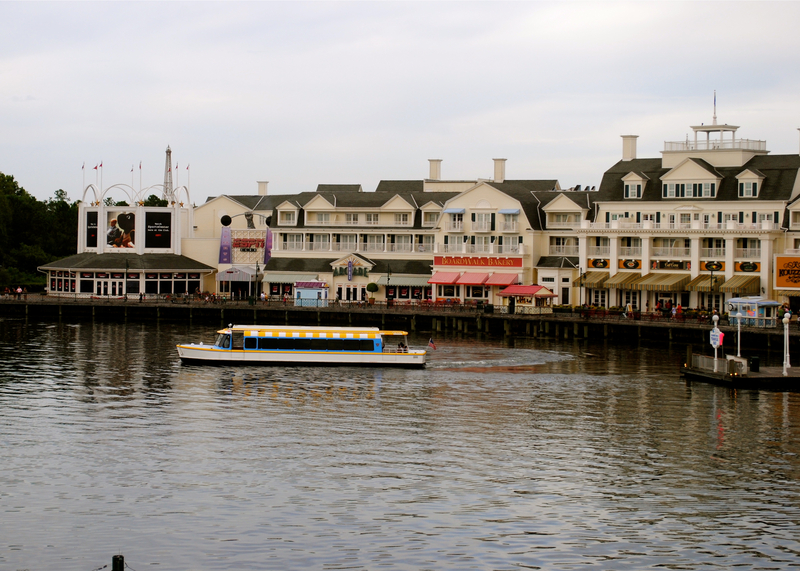 An example is The Beach Club (see my earlier article about The Beach Club) where you can walk to Epcot, take The Friendship Boats to Hollywood Studios and buses to the other 2 parks. The walk to Epcot is about 5 minutes and the boat ride to Hollywood Studios is about 15. You can walk home from Hollywood Studios, but this is only viable if the lines are incredibly long for the Friendship Boat. Another good example is staying at The Bay Lake Tower (I wrote about this resort earlier, too) which is my favorite resort. If you stay here, you can walk to Magic Kingdom. You can take the monorail to either Magic Kingdom or Epcot. Many times the line for the monorail is so long that it is much quicker to walk to Magic Kingdom. It is less than a 10 minute walk. Staying at The Grand Floridian (which I will review soon) presents other choices. You can take the monorail to Magic Kingdom or a boat. Take the monorail. You take the monorail to Epcot. I realize the majority of resorts at Walt Disney World only offer bus transportation to get to and from the parks. Some people tell me it is quicker to drive to the parks (if you have your car obviously) than to take the buses. This is why some people want to stay at the Old Key West resort. You can park next to your room there. Try to choose a resort with easy access, either on foot, by monorail, friendship, or bus to the park where you plan to spend most of your time. This will cut down on travel time, which can be rather long. In general, the Epcot resorts will have the easiest access to Epcot and Hollywood Studios; Magic Kingdom Resorts to Magic Kingdom, and Animal Kingdom Lodge to Animal Kingdom. Guests staying on Disney property are treated to Extra Magic Hours during which one of the parks either opens an hour early or stays open up to 3 hours late for these guests only. This varies by the season and the day of the week. A schedule is available at every resort. This is one of the biggest perks to staying on-sight, but there are others such as using all of the transportation options. The wait times for e-ticket rides (rides with the longest waits) are minimal with morning Extra Magic Hours. You can almost walk directly onto rides like Rock n’ Rollercoaster, Expedition Everest, Toy Story Midway Mania, Seven Dwarfs Mine Train, and Soarin’. Getting these rides done early allows for extra time and a relaxed pace later in the day. 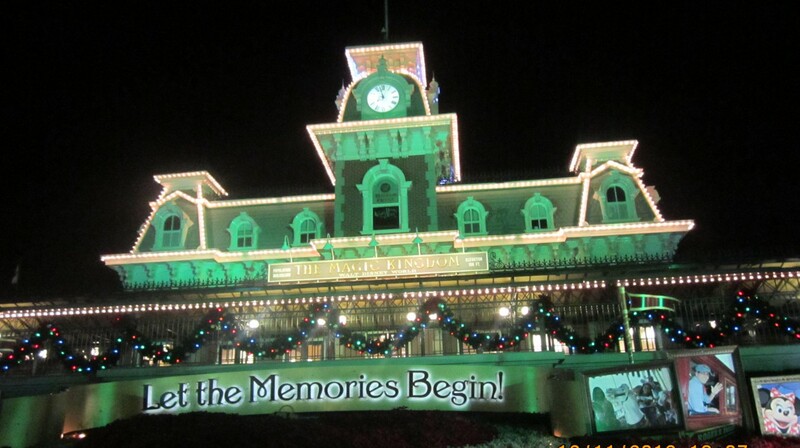 For night time Extra Magic Hours, the lines shorten as it gets later and by the end of the night, you can often almost walk onto the e-ticket rides. The attractions with short wait times are actually more enjoyable to me at times than the attractions requiring a FastPass. There are so many options. I wrote about some earlier. 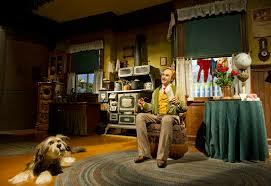 Two that I mentioned are The Carousel of Progress and Philharmagic. These are both quality entertainment, don’t require a FastPass, and usually have a minimal wait. 4) If you can’t make it to the park with that day’s morning Extra Magic Hours until after they are over, then skip it and go to another park. The park with the morning Extra Magic Hours is usually the busiest throughout the morning and afternoon; sometimes until park closing. You will have longer wait times. 5) If you want to see one of the Magic Kingdom parades, don’t sit for an hour on the curb trying to get just the right seat on Main Street. You can see very well from other locations along the parade route, and you can avoid getting caught in the traffic when the parade is over. More tips are coming in Part 2 of the article. Your input is appreciated. Please leave comments. If you would like more Disney information, then click “follow” and receive emails of each of our articles. Elaine (Perdita) – Mom, wife, Disney addict. 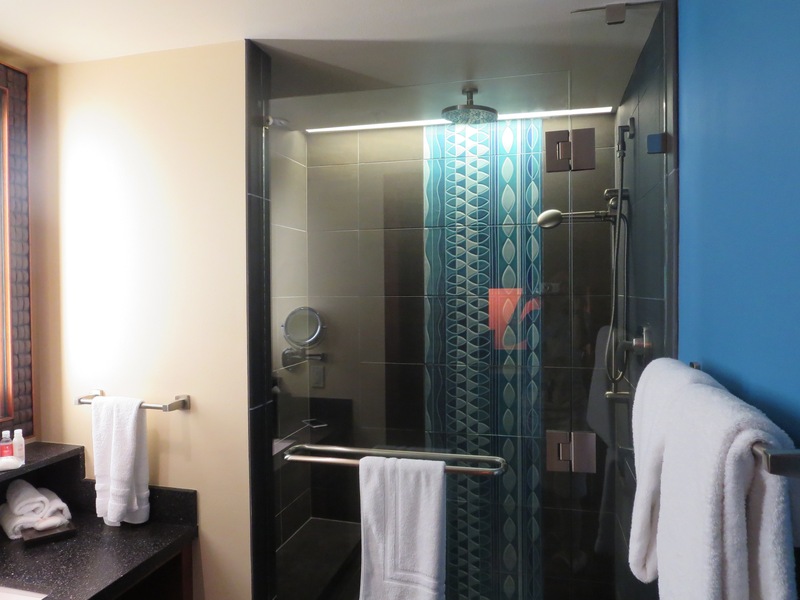 We recently returned from a stay at the newly opened (opened April 1, 2015) Polynesian Villas (a new Disney Vacation Club property). We stayed in the Moorea Building with a lake view. This will be, without something changes, our last stay in the villas at the Polynesian. Our stay was not a very pleasant one, which I am sad to report. Our stays at the other Disney Vacation Club properties have been more pleasant. I will give the good, and the bad in this review. I will start with the good. The villas are beautiful and large with a split bathroom plan. 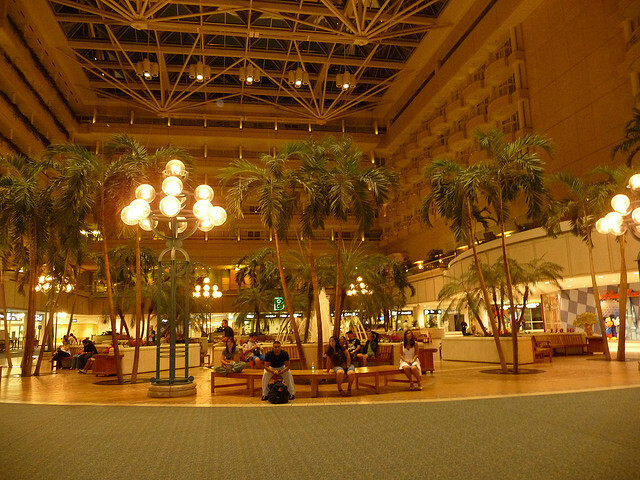 The refurbishment done in the Polynesian lobby enhanced the appearance of that area. The main pool was refurbished as well and is now called the lava pool. It is visually appealing. The lake view we had in our villa was nice. The resort is a Magic Kingdom area resort. It is on the monorail system; therefore a short monorail ride to the Magic Kingdom and a longer ride to Epcot. A bus must be taken to Hollywood Studios or Animal Kingdom. Now the bad. ( Let me begin this section with stating I really hate giving a bad review to any Disney property or experience. I am writing this to be informative not to bash.) The experience at the Polynesian started badly with check-in. The young man was very abrupt and uninformative. I told him we had never been to the Polynesian and asked where we could get quick-service dining and I asked about the gift shops. He said all the restaurants were upstairs and seemed to indicate all of the gift shops were on the first floor. He was wrong on both counts. The quick-service restaurant was on the first floor. The expensive restaurants were on the second floor and I didn’t find out until we were leaving that there were two more shops on the second floor. The first (and only) night we stayed was a disaster. We came back from Magic Kingdom by boat. We were leaving Magic Kingdom after 1:00 a.m. and found out the monorail transportation had ended for the night and the boat was the only way to get back to our hotel. This mode of transportation is slow; taking us almost 30 minutes to get back to our hotel. The hotel was only properly lit to take us back to the main building (known as The Great Ceremonial House). When we tried to make it back to the Moorea Building where our DVC villa was, the path wasn’t lit at all. My son thankfully thought of the flashlight on the phone to guide us back to our building. When we finally arrived it was around 2:00 a.m. There was a large boat that docked close to our room and it sounded the whistle almost constantly from 3:30 (or at least I finally fell asleep then) and awoke me again at 7:30 a.m. I am not a light sleeper, but this whistle was very, very loud and incessant. When I found I couldn’t get back to sleep, I went to the front desk to complain about the noise. So, in summary, I can’t muster up much good to say about the Polynesian villas. Also, as a footnote, a website called Mouseowners (a message board for DVC owners) had 7 pages of complaints about the noise at the Polynesian villas last night entitled ” Poly boat horn thread”, so ours isn’t an isolated case. One of our favorite places to stay at Disney is the Beach Club Villas. It is in a building next to the Beach Club Hotel. It is considered one of the Epcot resorts since it is within walking distance to Epcot. 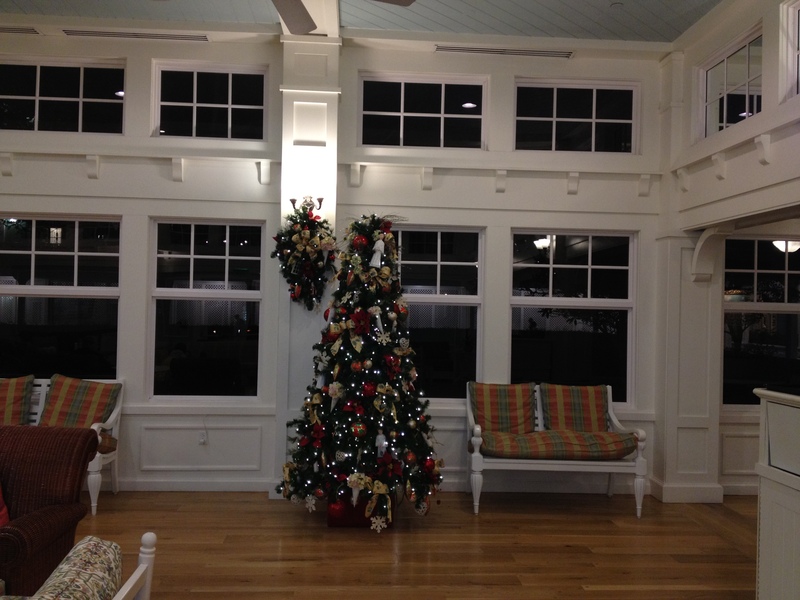 Our favorite time to stay at the Beach Club Hotel or Villas is at Christmas due to the atmosphere: the smells, the decor, the music, etc. The hotel is usually a minimum of $400/night, so we stay at the villas and use our points from the Disney Vacation Club (DVC). (Upcoming article about the DVC). The Beach Club Villas are perfectly placed if you are a big Epcot or Hollywood Studios fan. You can easily walk to Epcot and you can take either a longer walk to Hollywood Studios or take the Friendship boats (which are very relaxing). The Beach Club Villas book up very early for two special events: The Epcot Food and Wine Festival in the fall and The Flower and Garden Festival in the spring. If you own points at the Beach Club villas you have to book your vacation out for these events 11 months in advance to get a room. First, you don’t have to be a DVC (Disney Vacation Club) member to stay here. It is, like the Beach Club Hotel, considered a deluxe resort. The villas come equipped with a small kitchenette in the studios which are the smallest rooms available at the villas. The studio is similar in size to the standard hotel room at the Beach Club Resort, except for the addition of the kitchenette. The room sizes go up to a 3-bedroom villa, but so does the price. In the studio there are no washers and dryers, but there are some available free of charge in the building. The food options and gift shop is in the Beach Club Hotel which is a short walk from the villas. The quick-service meal option is located in the gift shop. The selection of food is tasty, but limited at the Marketplace (the food service deli counter in the gift shop). The gift shop has a good selection of both snack food, drinks, clothing, OTC medicine, Disney pins, etc. If you belong to the Disney Vacation Club DVDs are available here for viewing in the villas free of charge. Package pick-up is also available here (for those who buy items in the parks and have them sent back to the resort). The Beach Club villas have their own pool and hot tub. Guests may also use the Beach Club pools and hot tubs. One of the pools at the Beach Club is the most popular in all of Disney World. It is called Stormalong Bay; a 3-acre pool with a lazy river, fantastic water slide, and a sand bottom. Stormalong Bay is, in my opinion, the best pool that we have been to at Disney. 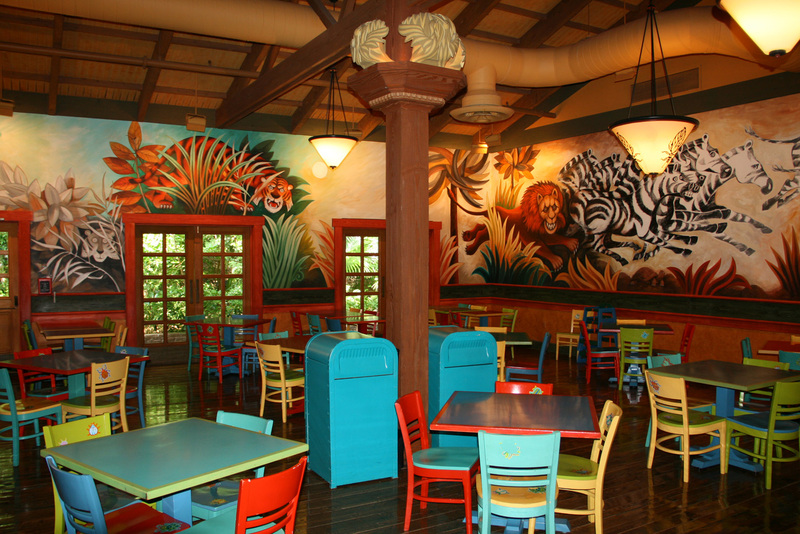 It has plenty of seating and has great theming. 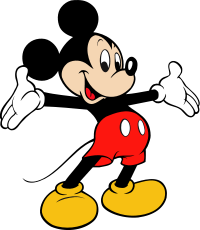 The Beach Club has a table service restaurant called Cape May where there is a seafood buffet in the evening and a character breakfast in the morning. Beaches and Cream is like an old-fashioned soda shoppe with ice cream treats and burgers, etc. There is also a quick-service option at the pool that serves sandwiches, snacks, sodas, and alcoholic drinks. 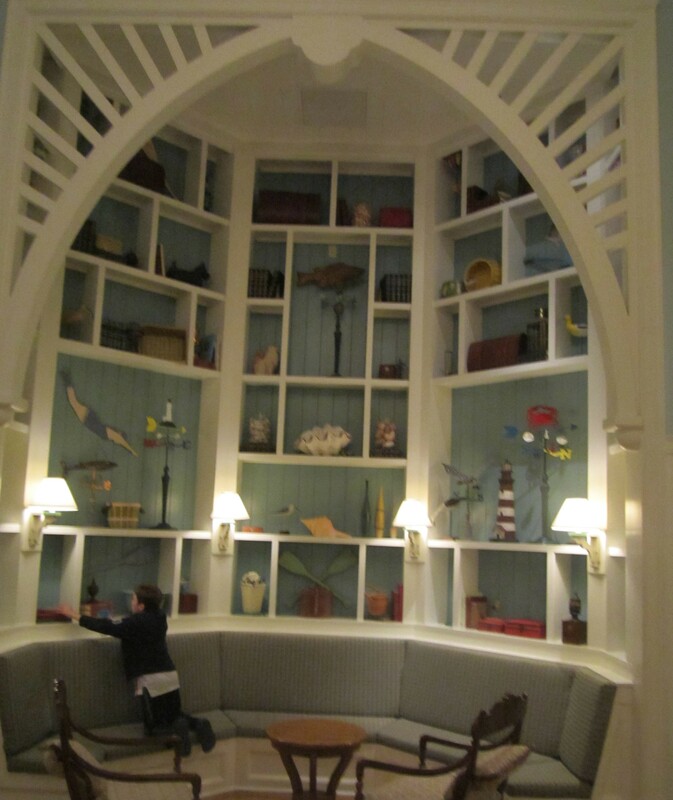 The Beach Club is my favorite resort at Disney decor-wise. It is decorated in a Victorian New England seaside theme. The Beach Club Villas and the Beach Club Hotel look different but have similar theming. At Christmas, it is decorated beautifully with a homey, warm feeling. The aroma as you enter the lobby is so wonderful with a mixture of vanilla and gingerbread. Among the decorations at Christmas is a carousel made of gingerbread. Some years they have had a stand selling gingerbread. 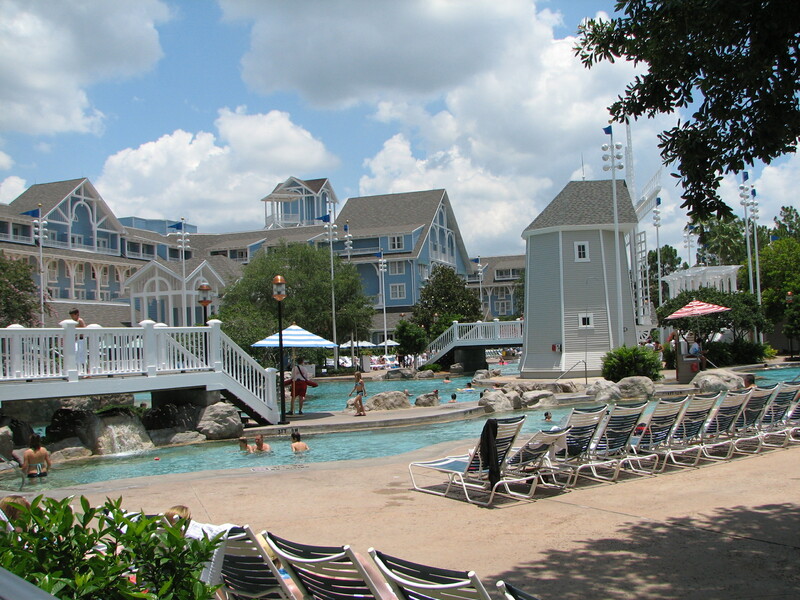 In summary, The Beach Club Villas or Hotel is one of the most desirable places to stay in all of Walt Disney World. Some things that we hear just seem to bring a smiles our faces. The magic of Walt Disney World is in the attention to details. One part of this is the use of the spoken word to reach out to us, guide us, and entertain us. There are obviously many examples of these. Here are few that strike a chord with me. “Hello. Welcome to Soarin’. 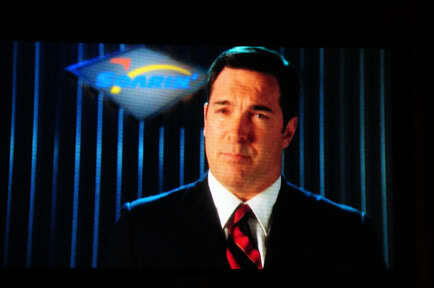 My name is Patrick and I will be your chief flight attendant today.” Soarin’ in Epcot is one of my favorite rides and Patrick Warburton’s intro makes me smile every time. “It’s out of this world!” Hearing Mickey Mouse say this while riding the Tomorrowland Transit Authority in Magic Kingdom or hearing it on loop while on the ground is again a smile inducer. 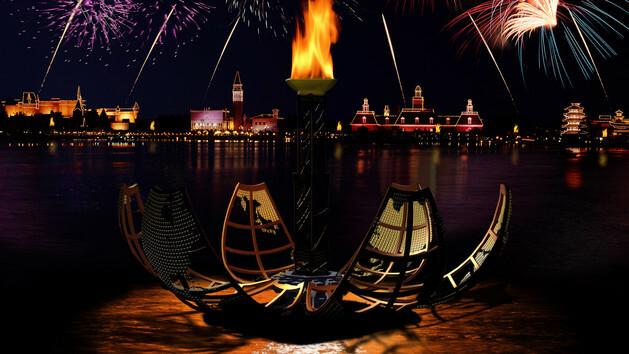 “We’ve gathered here tonight around the fire, as people of all lands have gathered for thousands of years before us, to share the light and share the story-“ The intro to Illuminations is an emotional and powerful lead in to my favorite fireworks show. I love how it ties us all together. “Welcome home!” Hearing this from cast members when checking in at Disney resorts helps make things more personal, and however corny it may be, does help it to feel like home. “Por favor mantengase alejado de las puertas.” Who doesn’t love hearing this on the monorail. “And now I believe your future is just about ready. Let’s take a look. Shall we?” Spaceship Earth is a great ride with a wonderful ending. We usually do silly faces for the snapshots. 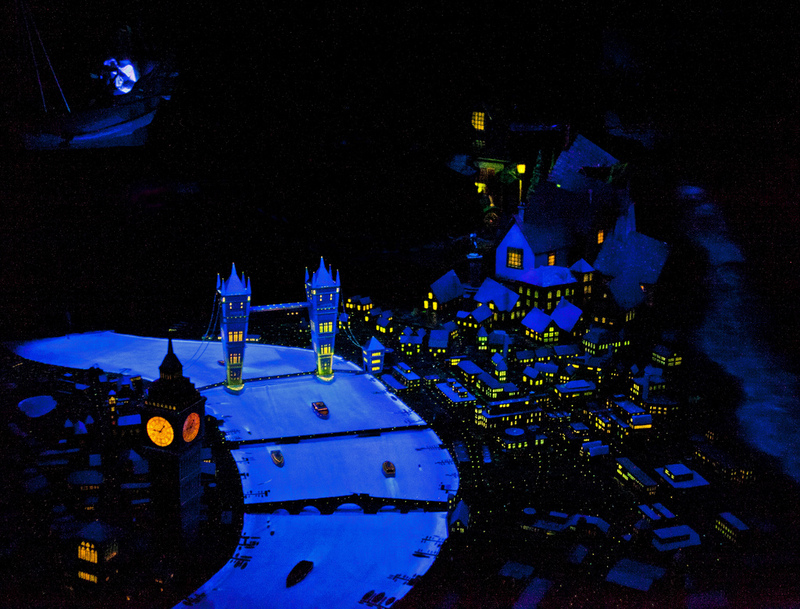 “And off we go!” Who doesn’t love Peter Pan and flying above London and Neverland. 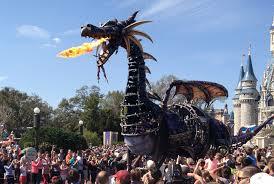 Do you have any sayings from WDW of which you are particularly fond? For those of you who have never flown into the Orlando Airport and tried to get to Disney World, I will give step-by-step instructions. Upon arrival, depending on what airline you arrive on, you walk past the arrival gates and come to a central area with shops and a few restaurants. You then board a tram which takes you to another building. 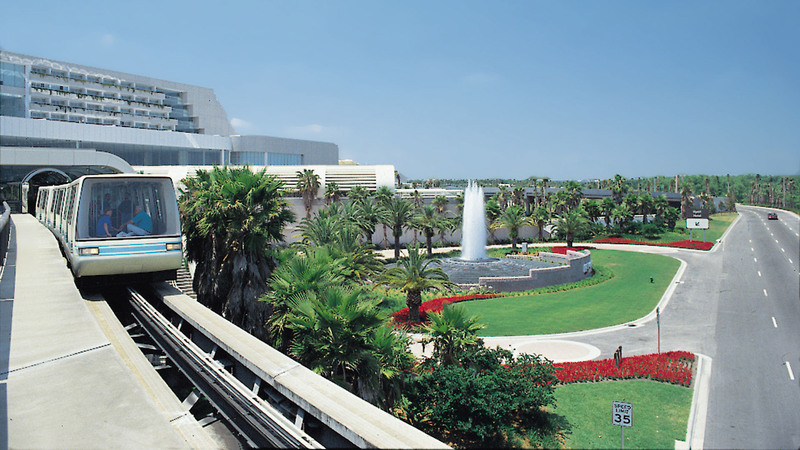 Upon arrival at the main building you walk past the airport security on your left and arrive at a central area of the Hyatt hotel. The central area of the Hyatt. You have a choice of going to Terminal A or Terminal B. 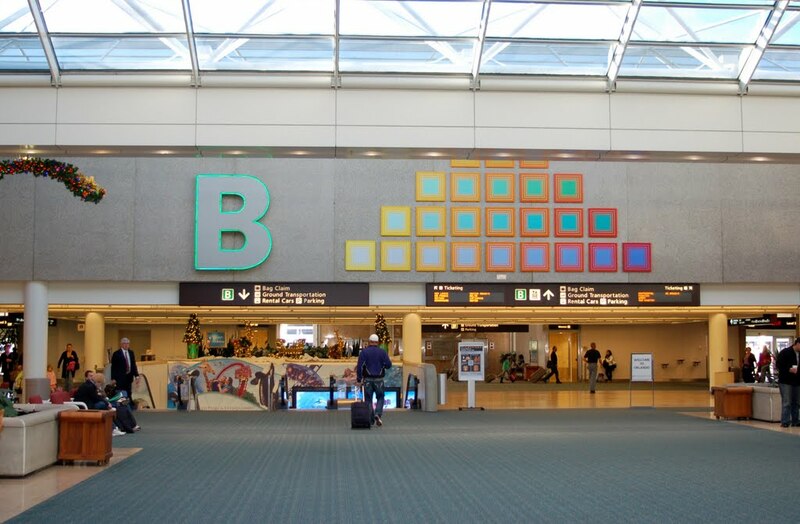 You need to veer to the left and go through Terminal B. You then look for an escalator or elevator and go to the first floor where there is ground transportation (There are signs that say ground transportation). If you are renting a car this is where you would find the car rental desks. If you are taking The Magic Express (a free service provided by Disney World, which I would heartily endorse) you go to the end of the ground transportation area on the first floor and this is where you will find the Magic Express bus service to the resorts. You scan your magic band or present a ticket Disney sends through the mail to you. A friendly Disney employee then directs you to the line you should wait in. It is usually a short wait before they tell you which bus to board. The bus driver places your carry-on luggage underneath the bus. 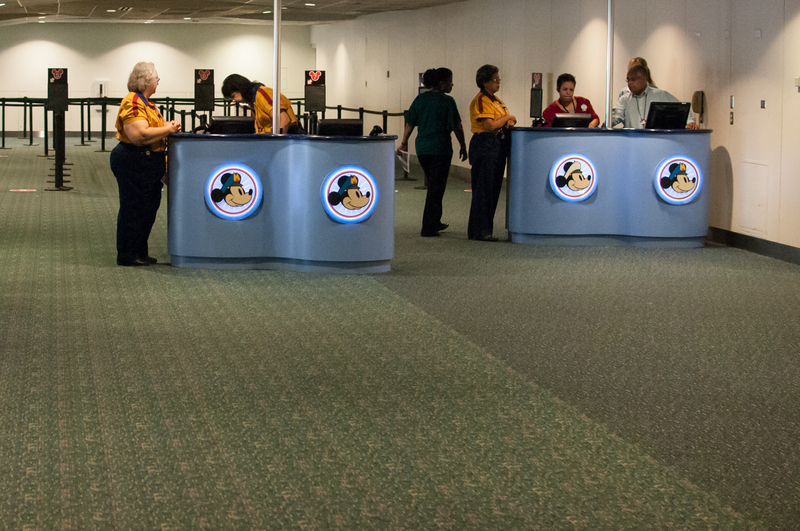 These helpful Disney/airport cast members will direct you to the right bus. If you do take the Magic Express bus service, you may wait on the bus for up to 20 minutes, but the time goes by fast as your anticipation of arriving at Disney World grows. The seats are comfortable and they play a video of information about Disney World and some cartoon shorts. It takes about 25 minutes to arrive at Disney World. Depending on how many stops your bus makes before the bus arrives at your resort, it takes anywhere from 10-20 minutes to actually pull up to your resort. Upon arrival, the bus driver gives you your carry-on luggage and someone at the resort greets you by name and leads you inside to the check-in desk. Another perk I must mention: if you checked any luggage, you don’t have to wait at the airport to pick it up and take with you on the Magic Express. Disney will make sure your luggage arrives at the resort and will either hold it at bell services or they will bring it to your room. Some people aren’t as enamored with Disney as we are and one of the reasons I hear is the crowds. I understand this as the crowds are about the only thing I don’t like about Disney World. There is a way to avoid this to some extent and have a little more peaceful vacation. Stormalong Bay is, in the best pool that we have been to at Disney. It has plenty of seating and has great theming. One major way to find some peace at Disney World is to not try to do everything in one day or even in one trip. Take a mid-day siesta or at least rest. Lounge by the pool or pop in a DVD (free for DVC members). If you are in the parks, there are a few secluded spots. A particular favorite of mine is in the seating area in the back of the Great Britain Pavilion of Epcot. It is beautiful and almost always quiet. In the Magic Kingdom the People Mover in Tomorrowland is always quick to board and a peaceful ride around Tomorrowland. Hollywood Studios has seating available in various spots; some more quiet than others. Animal Kingdom has some benches tucked away in various spots in the shade. 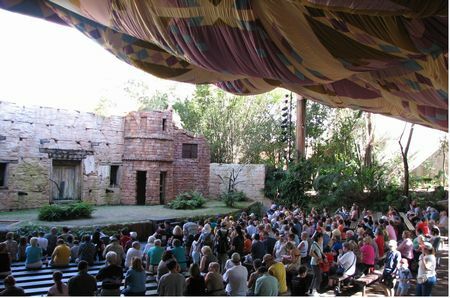 The Flights of Wonder is a bird show that is relatively peaceful and there is always available seating. Flights of Wonder is a great, entertaining show with ample seating. Another thing to consider is time of day and park. The park opening and close to park closing has the thinnest crowds; with midday being busy almost always. I am not an early riser, so I opt to try to stay until park closing. Magic Kingdom is the busiest of the four parks, which is understandable being the “most magical” park to most folks (myself included). Usually the park that has extra magic hours in the morning will certainly be the busiest throughout the day and sometimes into the night. The park with the extra magic hours in the evening will also tend to start to get busier as evening approaches. 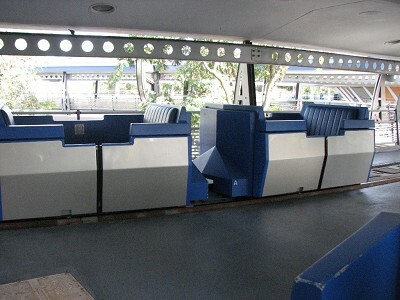 The Peoplemover is a relaxing ride with normally no wait, and is a great place to have a seat and relax. Peace at Walt Disney World is attainable. Expectations going into your vacation will partially determine how attainable this is for you and your family. If you expect to get through every or most every ride/attraction in one trip you may feel very stressed and it may ruin your trip. If you come in with the expectation that you can/will return and try and take it slower and just see your must-see attractions you can find peace even in a crowded place like Walt Disney World. We have stayed at the Grand Floridian a couple of times. It is the prettiest property we have stayed at and the most luxurious with very upscale furnishings and accessories. I will do a review of this property another time, but today my focus is on the Bay Lake Tower. With the above comments about the luxurious nature of the Grand Floridian Villas you may be wondering how it wouldn’t be deemed my favorite. The biggest reason is the number of points it takes to stay there vs. the Bay Lake Tower. If you aren’t familiar with the point system of the Disney Vacation Club this can be confusing. Think of more points meaning more money. You can stay on a cash basis as well and it is more expensive at the Villas at the Grand Floridian. There are other things that make Bay Lake Tower “better” for us. Ease of getting a reservation, inexpensive food choices and proximity to those food choices, proximity to Magic Kingdom, more gift shops, etc. Now after this digression, my review of Bay Lake Tower. As I stated, it is a 16-story high rise with a modern feel inside and out. It is on the monorail system and connected to the Contemporary Resort via a covered walkway. 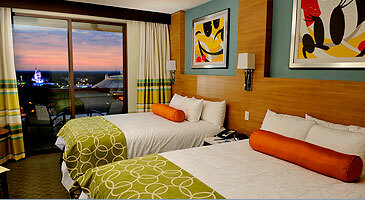 The rooms come with a Magic Kingdom view, a lake view (view of Bay Lake), or a standard view. Most of the rooms have a lake view so this is always what we have had. Most of the lake view rooms face the pool at the Bay Lake Tower and I enjoy it because we see huge clumps of bamboo, several species of palm trees and the Bay Lake. The rooms are decorated with contemporary furnishings and accessories, but still have a Disney theme with Mickey heads on the coverlet and modern Mickey pictures over the bed. The rooms come in studios, 1-bedroom villas, 2-bedroom villas and the largest a 3-bedroom villa. We always stay in the studio to conserve points. The studios come with a queen bed and a queen pull-out sofa (which doesn’t have the bar down the middle so it sleeps comfortably.) The studio is the only room that doesn’t come with washer and dryer, but there is a laundry room on the ground floor that is free for guests to use. There is a small kitchenette with microwave, small fridge, sink, and plenty of storage. It comes stocked with paper plates and bowls as well as plastic cutlery. Now to the perks of staying at Bay Lake Tower. I think the food choices are the best of the places we have stayed. They have a character dining experience called Chef Mickey’s which we haven’t tried. They have two pricier dining options: California Grill, and the Wave. We haven’t tried these either. We opt for the Contempo Cafe. The choices are wide, the prices reasonable, and there are many healthy options to choose from. There are three gift shoppes to choose from. 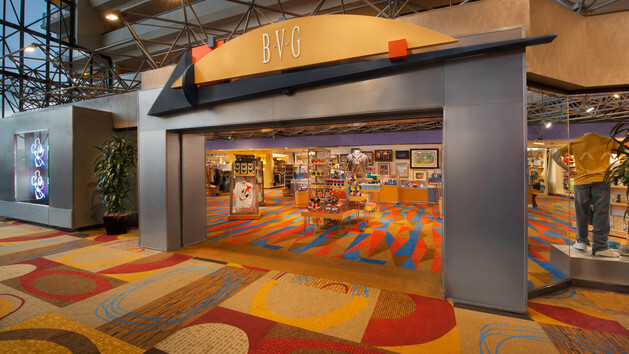 My favorite is called BVG and has a wide variety of merchandise that is always fun to walk through and to buy from. They have clothing, Christmas ornaments, jewelry, pictures, picture frames, purses, home decor, kitchen accessories and even treats like cookies and cupcakes in a glass case. 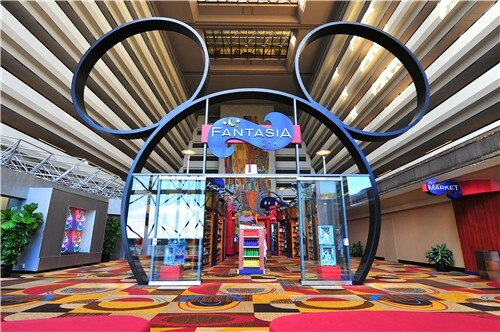 There is another shop across the hall called Fantasia which has a lot of toys, stuffed animals, books and a large selection of Disney pins. The third shop is called the Fantasia Market which has a small selection of food and drinks. This selection beats anywhere we have stayed thus far. I love being able to walk from the Bay Lake Towers to the Magic Kingdom. It is much more expedient than having to wait for the monorail. I like the monorail but many times we haven’t been able to fit on the first monorail and have to wait for the second one. Plus, you have to make three stops before arriving at the Magic Kingdom. I at first protested because of fatigue from walking so much already at the parks, but I have found the walk actually invigorating the last couple of visits. Another big perk for us is being able to check out two movies at a time from the Community Hall on the first floor. They have the best selection of movies I have seen by far at any of the resorts. There are four booklets filled with movies that are alphabetized and categorized according to ratings. They carry all 54 full-length animated Disney movies as well as live action Disney movies and some non-Disney movies. They have both well-known and more obscure movies. Bay Lake Tower like all of the resorts have pools, hot tubs, bocci ball, ping-pong, tennis, movie nights, and roasted marshmallows every night. There is a dock where you can rent boats for parasailing or for cruising the lake. You can also rent jet skis at the same location. 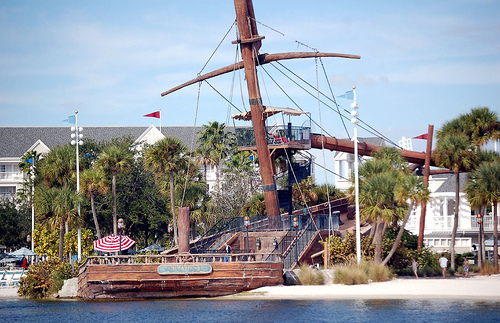 There is a pirate excursion that we have never taken part in but it does set sail from the Contemporary. The Friendships are my favorite mode of transport at WDW. The Monorails are great. The busses….get you to parks. The Friendships are enjoyable and an experience unto themselves. On the boats you get a great view of the Beach Club’s landmark. Themed to be a wrecked pirate ship, this is actualy a slide. and the interval becomes shorter. The Epcot World Showcase entrance is between the France and United Kingdom pavilions. The Hollywood Studios launch site is at the front of the park to the far left as you exit. Both pickups are closer than bus pickups. If you are staying at one of the above resorts, the Friendships or walking are your options to get to either Epcot orHollywood Studios. They are available for anyone wanting to go between the two parks, or wanting to stop off at one of the resorts. 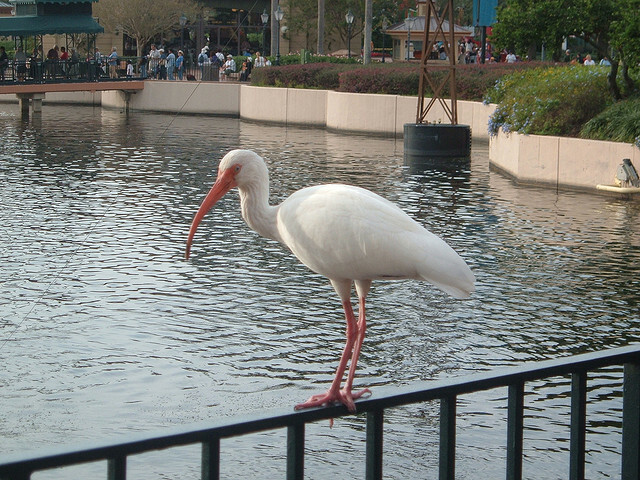 A picture of an Ibis in front of the Boardwalk. I like that they are rarely, overly crowded, except at peak times. You can sit inside, shaded from the heat or protected from the cold when it is cool, or if it is nice, there is open air seating at the back. They are reliable at being on time and at arriving at the parks in a reasonable time.. The seats are comfy and the ride is smooth. The sightseeing along the way is my favorite thing about the ride. 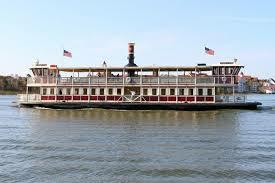 The Boardwalk Resort has a turn of the century, New York/New Jersey boardwalk theme. How the different architectural elements come together is impressive. The Yacht & Beach Club Resorts are beautiful with a mid-Atlantic Beach motif. The stop for the Yacht & Beach Club is at a lighthouse on Crescent Lake. There is the shipwreck on the beach which is the slide to the best pool at WDW, Storm-a-long Bay. The last resort stop is at the Swan and Dolphin. They are different, not quite fitting in with the rest. Across from these you can see the pool of the Boardwalk, with it’s Coney Island theme and a slide shaped like a roller coaster, emptying into the pool through a clown’s mouth. The final jaunt along the canal to Hollywood Studios is great for bird watching. We have seen ahingas, herons (great blue, little blue and white), egrets, ducks (mallards and ring-necked), loons, white ibis, hooded merganser, double-crested cormorant, American coots, and gallinult during our Friendship rides. There are many other reasons to take a trip on a Friendship. There are many great table service restaurants at each of the hotels. The Friendships make it easy to reach these in little time if you are spending your day at either Epcot or Hollywood Studios. Reservations are usually required, but are easier to get than at the parks. There are also good quick service restaurants at the Boardwalk resort including a bakery and pizza window, which has delicious, New York style pizza at a very reasonable price.The Beach & Yacht Club has the famous “kitchen sink” sundae at Beaches and Cream. Street performers (mimes, jugglers, magicians) entertain along the boardwalk at night. A gingerbread merry-go-round at the Beach Club and a gingerbread house at the Boardwalk stand during the Christmas season. The Friendships are a enjoyable way to commute between Epcot and Hollywood Studios. Go for a ride. Take in the sites. Maybe, get some pizza or ice cream. I think that you will become a fan like me. You cannot go wrong with any of the WDW deluxe or DVC resorts. We each have different ideas of what will help make the perfect vacation. Here is a guide to help you choose which resort will make this perfect vacation easier to achieve. Follow the outline to find the right resort for you. What is the most Most Important Factor that the resort can offer? A. 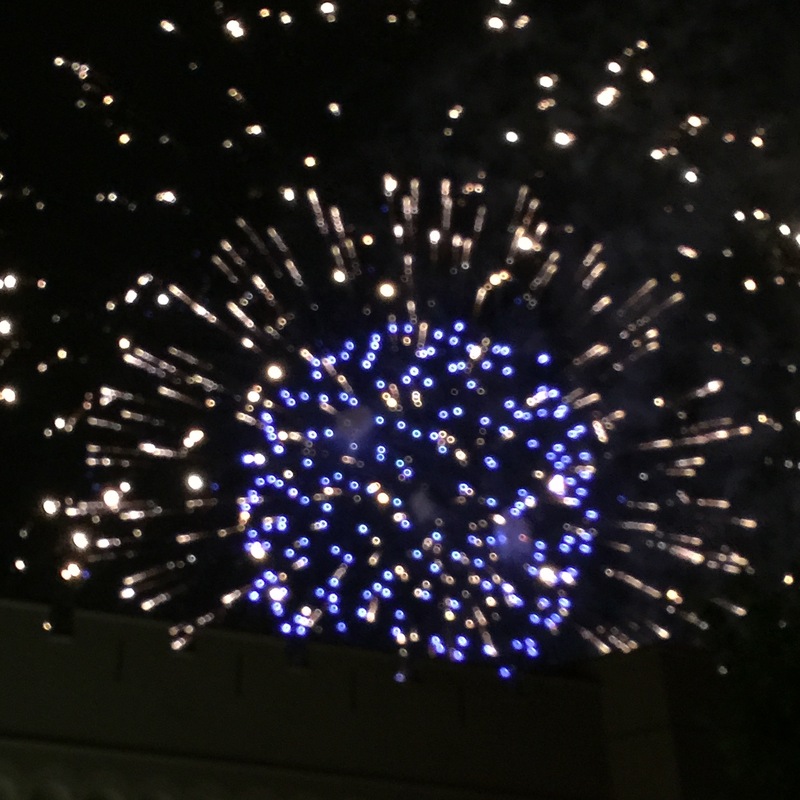 Proximity to the resorts: If you plan on spending most of your time at a particular resort, then this is very important (Magic Kingdom for the kids, Epcot for the “Food and Wine” or “Flower and Garden” festivals). easily walk the half mile. It is the only resort from which you can walk directly to Magic Kingdom. b. Grand Floridian. Easy access to MK from monorail. Great ambience. c. Polynesian. Also on the monorail. Island food and atmosphere. 3. Hollywood Studios. Any of the Epcot resorts have DHS access via the friendships or on foot. a. Boardwalk. It is about a half mile walk to DHS along the waterway. b. Beach Club/Yacht Club. Approximately 1 mile walk. 4. Animal Kingdom can only be reached by bus from any resort. 1. Animal Kingdom takes you to Africa with views of the savannah (including giraffes, zebras, etc.) Rooms are like sleeping in a tent while on safari. The lobby with art and artifacts is amazing. Many of the staff are African. 2. Wilderness Lodge transports you from Florida to the Western mountains. It’s like a slice of Yellowstone. tip it over the top. C. Resort activities. If you are looking for a more “traditional” vacation with shopping, golf, and spa treatments. here. 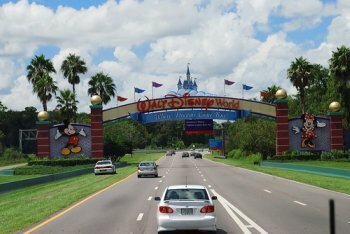 * You can walk to Downtown Disney for shopping and night life. D. Access to your car. This can be important if you plan on driving to other resorts or to the parks, or even to other places in the Orlando area. Disney transport can take up to hour to get you from one resort to another for dinner reservations. 1, Old Key West allows parking near your room and the easiest car access. * all resorts offer taxi vouchers to and from any of the WDW golf courses.